The book tells the story of Philip Marsham who, after his father’s death at sea, must flee his ill-tempered would-be stepmother and forge a life on his own. Inevitably, the young man finds himself out to sea like his father, and all seems well enough until his vessel, the Rose of Devon, comes under the control of a band of crafty, sinful pirates. Click here to purchase The Dark Frigate. Thus, the majority of the story is situated upon how Philip deals with this malevolent turn of events, and one would be hard-pressed to find a better pirate story/naval adventure. My favorite elements include the hero’s Atlantic voyage from England to the Caribbean, the descriptions of tropical islands and the knowledgeable and (seemingly) authentic naval language. Unfortunately, two things keep the book from being a complete triumph: the early revolving cast of characters and the somewhat antiquated English. In most stories, the author lays out the characters, theme, setting and other elements very early. Specifically, key characters are introduced rather soon so that character development might begin from the outset. With few exceptions, this is a very effective way of drawing the reader into the narrative. Hawes does not exactly follow this formula. Rather, at the beginning of The Dark Frigate, after Marsham escapes his fat would-be stepmother and before finding his berth on the Rose of Devon, the author introduces a parade of characters who end up having nearly nothing to do with the story whatsoever. It is confusing not knowing who is important and who isn’t, and matters are made even more confusing since even inconsequential characters are given sizeable scenes. As many early characters are quickly discarded, it really is difficult to discern who is actually important and who is just another random character. As I realized that most of the characters would soon be out of the story, I found myself struggling to fully connect with any characters other than Marsham. This feature does not completely ruin the affair, but it does inhibit the reader’s ability to fully invest in any early characters, thereby slowing the early pace and thus making The Dark Frigate a tough nut to crack initially. Further putting the reader’s early comprehension in peril is the use of a very mild form of what Robert Louis Stevenson called “tushery.” That is, old-fashioned English. I count at least eight archaic pronouns and six other assorted words that most young adults might not understand. And that paragraph takes place near the very beginning of the book when the tone, flow and characters would usually be established! For a book intended for an audience of people in 1924, I’m sure this language is completely fine. But, it would be challenging and daunting for most modern readers. Still, I found the early comprehension struggles to be well paid off once Marsham boarded the Rose of Devon. From there, things seemed more understandable and immensely enjoyable. 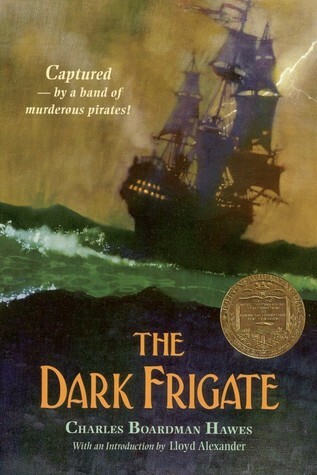 In conclusion, I recommend The Dark Frigate to anyone who enjoys historical fiction, adventure or naval stories. I also recommend it for anyone seeking to read every Newbery Award winner. On the other hand, if you dislike pointless characters, slow beginnings, or if you aren’t a fan of dealing with pre-modern English, you might (to use a naval phrase) consider giving this one a wide berth. I’m not so sure about pursuing reading The Frigate, but this review was well worth the chuckles I enjoyed when reading the final thoughts regarding Grants’ renowned “awards”! Where do you come up with all this hilarious stuff, Grant?? ?